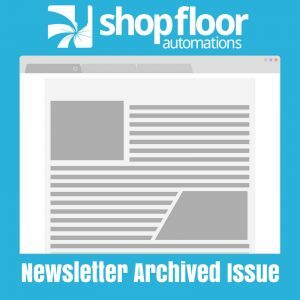 The following is an archive of the Shop Floor Automations Newsletter from March 2011. Our focus is building lasting partnerships with customers and striving to understand what customers manufacture, what production tools and methods they currently utilize, and in what ways we can help improve their manufacturing processes. Are you ready for us to help you with our shop floor solutions? Looking to improve communication to your CNC machines? We are offering onsite services to fine tune your existing DNC system up to 50% off our normal rates. Add cabling to a new machine, troubleshoot, move the system to a more reliable PC, or provide onsite training and consulting. Visit our website and complete the online form or call us for details. The LANCNC controller brings Ethernet functionality to any CNC machine tool with serial capability. Program files can be sent to/from the LANCNC data server and any CNC. Large files that will not fit in the memory of the CNC can be drip fed (DNC) directly from the data server. Control and manage which files are available to operators on the shop floor from CNC programming stations or Engineering department. Works with Microsoft’s Windows Explorer. Setup with ease and connect to virtually any CNC control on the market. PC based controls have become the standard for new CNC machines and for good reason. For the first time, PC based controls allow CNCs to be truly integrated into a manufacturer’s overall enterprise in the same way that other PCs already are. The advantages of integrating CNC controls into an enterprise network are many, but so are the possible issues.